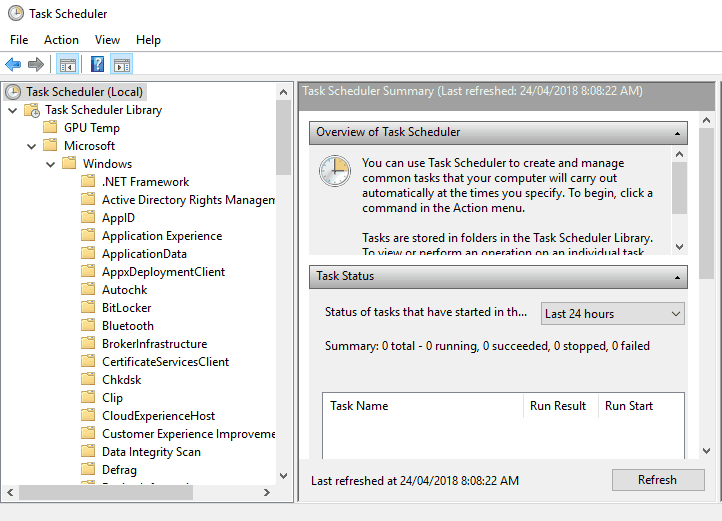 The Task Scheduler is an invaluable tool with which you can schedule software, scripts and other tools to run at specified times. So this can come in handy for scheduling updates and other maintenance scans. However, if the scheduled tasks aren’t running as they should, the Task Scheduler isn’t going to be of much use. Here are some suggestions to fix Task Scheduler tasks that aren’t running. Scheduled tasks not running, how to fix them? 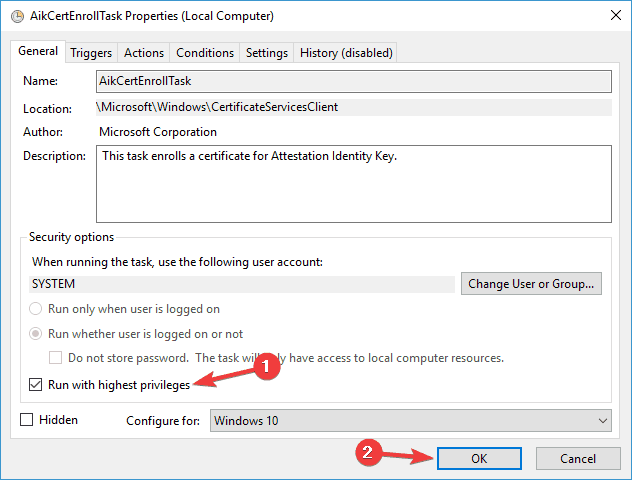 Task Scheduler not working Windows 10 – Many users reported issues with Task Scheduler on their Windows 10 PC. We already covered a similar topic in our Task Scheduler not running article, so be sure to check it out for detailed solutions. 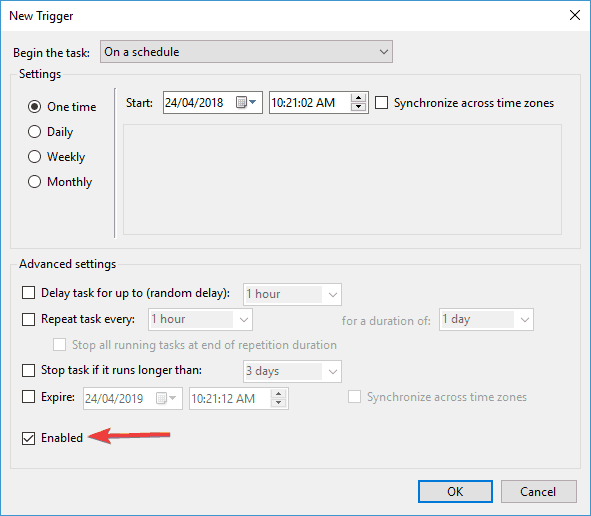 Windows Task Scheduler does not start task at next run time – Task Scheduler is a complex tool, and sometimes your task might not start at the scheduled time. 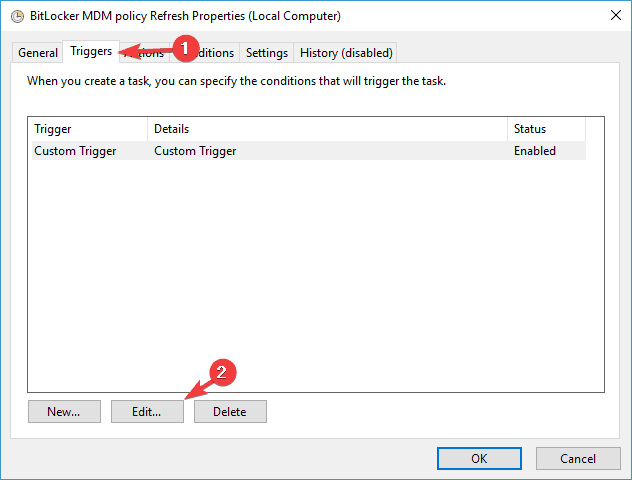 To fix the issue, be sure to check if task trigger is properly configured. Scheduled task runs manually but not automatically – This is another common problem with Task Scheduler. If you encounter this problem, be sure to check if your conditions are properly configured. 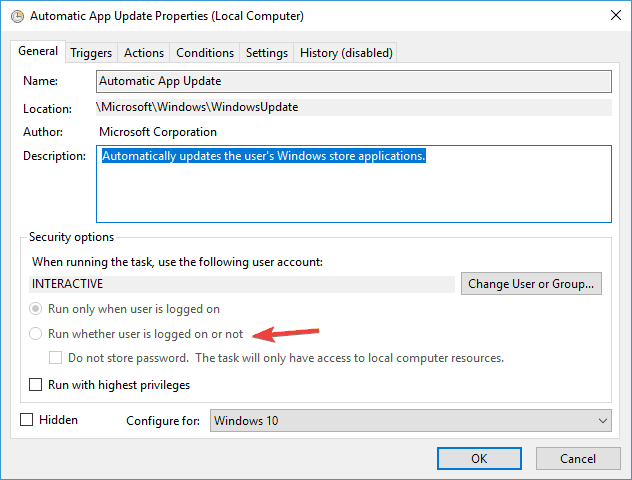 Windows scheduled tasks not running when logged off, after log off – Sometimes certain tasks won’t run on your PC if you’re not logged on. However, you can fix that issue simply by enabling Run whether user is logged on or not option. 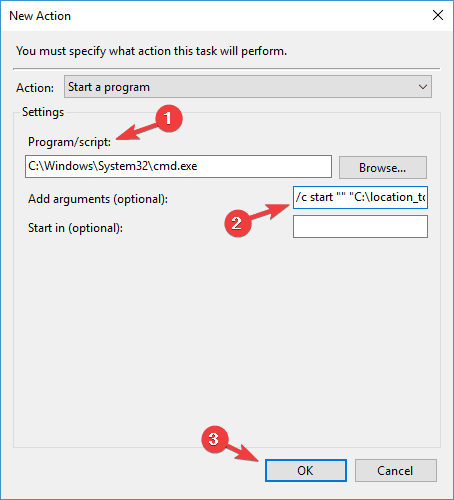 Task Scheduler not running exe – If you can’t run exe files using Task Scheduler, it’s rather likely that the issue was caused by your task configuration. Check if everything is in order with the task and try to run it again. First, you should check the triggers for the task. It might be the case that the task isn’t enabled, in which case it won’t run. You can check the triggers as follows. Enter ‘Task Scheduler’ into Cortana’s search box and select Task Scheduler to open its window below. Is the task enabled there? If not, press the Edit button. Then select the Enabled check box and press the OK button. If the task is enabled but still not running, check the conditions. Each task has specific conditions that determine if it runs or not. It doesn’t run if one of the conditions isn’t met. Double-click a task on the Task Scheduler window to open its window. Then click the Conditions tab shown in the snapshot directly below. 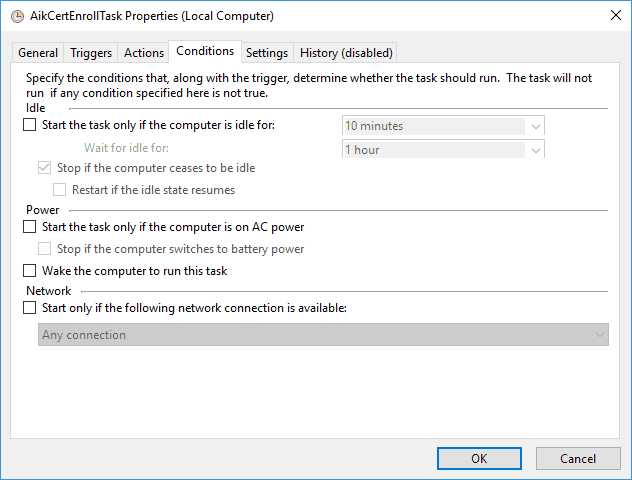 Note some of the condition options such as the Start the task only if computer is on AC power. If that’s selected, the task isn’t going to run on laptops that aren’t plugged in. Some programs can only run with higher privileges. For example, you might need to select Run as administrator from their context menus to open them. So you should check the privileges option. Click the General tab on a task window as in the snapshot below. That tab includes a Run with highest privileges check box. Select that option’s check box. Press the OK button to apply the settings. Another thing to note is the task’s user account configuration. Some tasks might be configured to run only with a specific user account. If you’re not logged into the right account, the task isn’t going to run. Select the General tab on task window again. 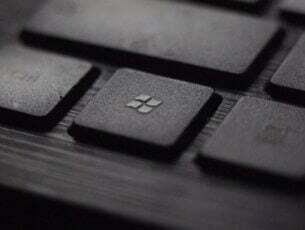 Press the Change User or Group button to open the window below. There you can check what account settings the scheduled task has. If you’re not using the right task account you could log out. Alternatively, reconfigure the task so that it runs in all user accounts and click OK.
Now locate your task and look for Last Run Result column. In there you should see if your task was completed successfully or not. If there were any issues, you should see a short summary and an error code. Using this information you can do a bit of research and find the direct cause. This isn’t a solution, it’s more of a useful tip that you can use while troubleshooting Task Scheduler. If you have any issues with scheduled tasks, be sure to check out Last Run Result column. 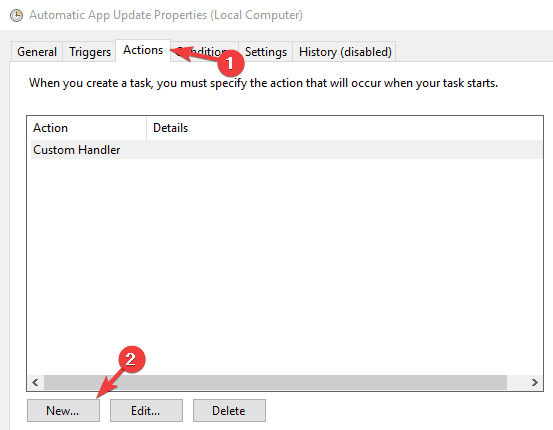 Start Task Scheduler, locate your task and double-click it to open its properties. 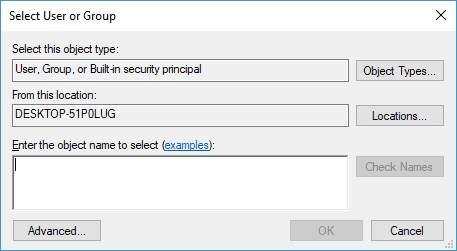 Now make sure to select Run whether user is logged on or not option in the General tab. Save changes and check if this option solves your problem. Locate your task in Task Scheduler and double-click it to open its properties. When the properties window opens, navigate to Actions tab and click New. In the Program/script field enter C:\Windows\System32\cmd.exe. Now in the Add arguments (optional) field enter /c start “” “C:\location_to_batch_file\your_batch_file.ffs”. Now click OK to save changes. After doing that, you should be able to run batch files from Task Scheduler without any problems. 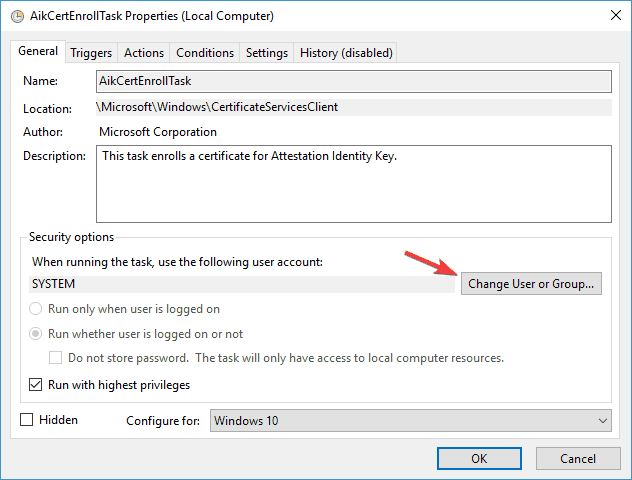 Task Scheduler is a default scheduling tool in Windows, and even though this tool is rather useful, sometimes you can encounter certain issues with it. 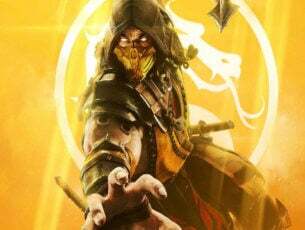 However, you’re not limited only to Task Scheduler, and there are many great task scheduler applications for Windows 10 available to download. These tools are just as good as Task Scheduler, and many of them are more streamlined and simpler to use than Task Scheduler. If you have problems with Task Scheduler, you might want to consider switching to a third-party solution. According to users, sometimes issues with Task Scheduler can occur if your system is out of date. There might be certain bugs on your system, and those bugs can lead to problems with scheduled tasks. To ensure that there are no issues with bugs, it’s advised to keep your Windows up to date. 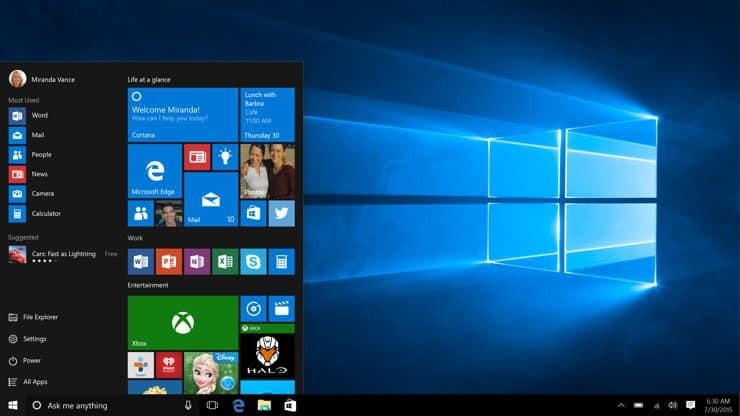 The updating process is streamlined in Windows 10, and in most cases, Windows will automatically download and install the necessary updates. However, sometimes you might miss an update or two, causing certain issues to appear. 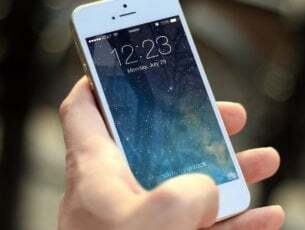 If any updates are available, they will be downloaded in the background. Once your PC is updated, check if the problem with Task Scheduler is resolved. If a task still isn’t running, try fixing it with third-party software. Fix My Task Scheduler is a lightweight program that can repair the Task Scheduler. With that you can fix corrupted or missing tasks. Open this page and click the Download button there to save the Fix My Task Scheduler archive file. It saves as a 7z file, so you can’t extract in with File Explorer. Extract it with the freeware 7-Zip utility instead. Then open the software’s window below from the extracted folder. Now press the Fix this now button on the software’s window. Fix My Task Scheduler will then do its magic. These tips could fix any Task Scheduler tasks that aren’t running. In most cases, a scheduled task not running will probably have more to do with its Task Scheduler settings; but if not you can run Fix My Task Scheduler and Repair Tasks to fix any issues.